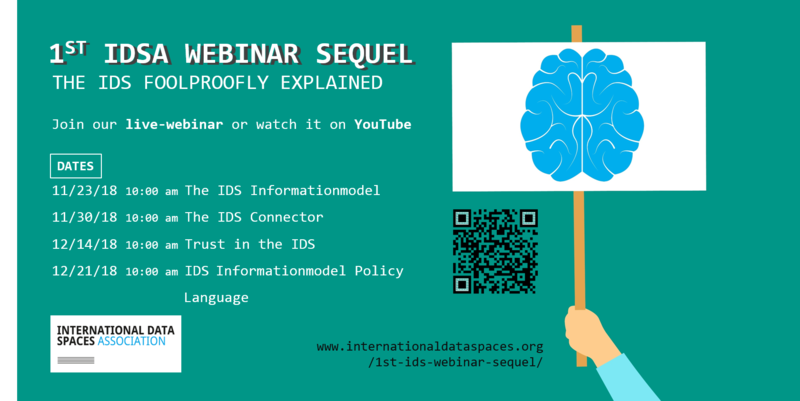 The International Data Spaces Association offers an interactive webinar sequel on the topic of the IDS Reference Architecture Model 2.0 and its base components as enabler for data sovereignty, in which all spectra of the IDS and the Reference Architecture are explained in a simple and user-friendly manner. With this sequel IDSA gives its members, project partners and all interested parties the possibility to learn on dealing with the IDS approach and the reference architecture model, and to create the basis for successful integration of IDS in data eco systems and future-oriented business models. Up to the end of 2018, leading experts such as Prof. Dr. Boris Otto (Fraunhofer ISST), Dr. Christoph Quix (Fraunhofer FIT), Lars Nagel (IDSA) and Gerd Brost (Fraunhofer AISEC) take the participants on an informative excursion through the IDS. The first five webinars on the “Context of the IDS”, “Process Layer of the IDS”, “Data Governance”, “The reference architecture model from a business point of view” and “Trust in the IDS” have successfully run and are available. Participants can join the live-webinars and will have the chance to ask questions, or watch it on the IDSA YouTube channel. The webinar series is partly produced and facilitated by the research projects “Industrial Data Space” and “Industrial Data Space+” funded by the German Ministry of Education and Research BMBF, as well as the Research and Innovation Actions “MIDIH – Manufacturing Industry Digital Innovation Hubs” and “BOOST 4.0 - Big Data Value Spaces for Competitiveness of European Connected Smart Factories 4.0” of the European Union’s Horizon 2020 research and innovation program.